On 29 March 2019, the United Kingdom (UK) is set to leave the European Union (EU). 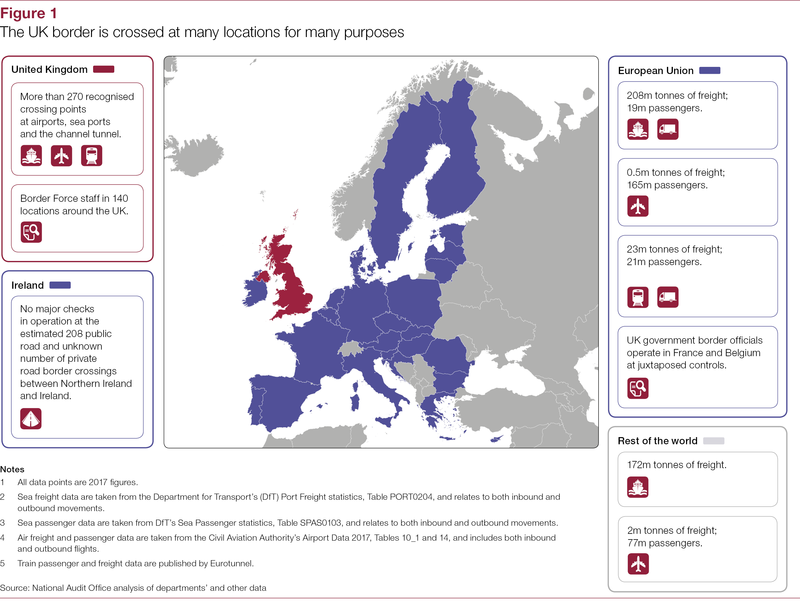 The UK’s management of the border is currently heavily influenced by its membership of the EU, which allows free movement of goods, services, capital and people across member states. 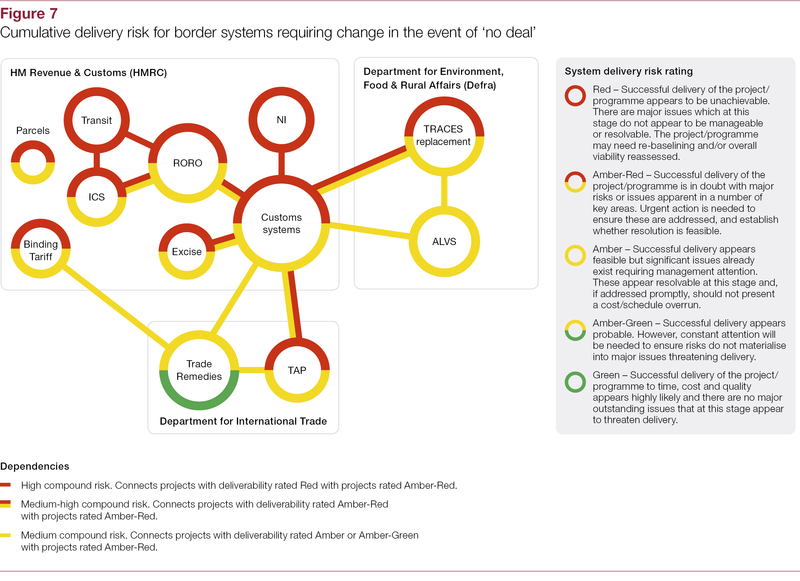 The ongoing negotiations on the UK’s future relationship with the EU will determine how the border operates when the UK leaves the EU. 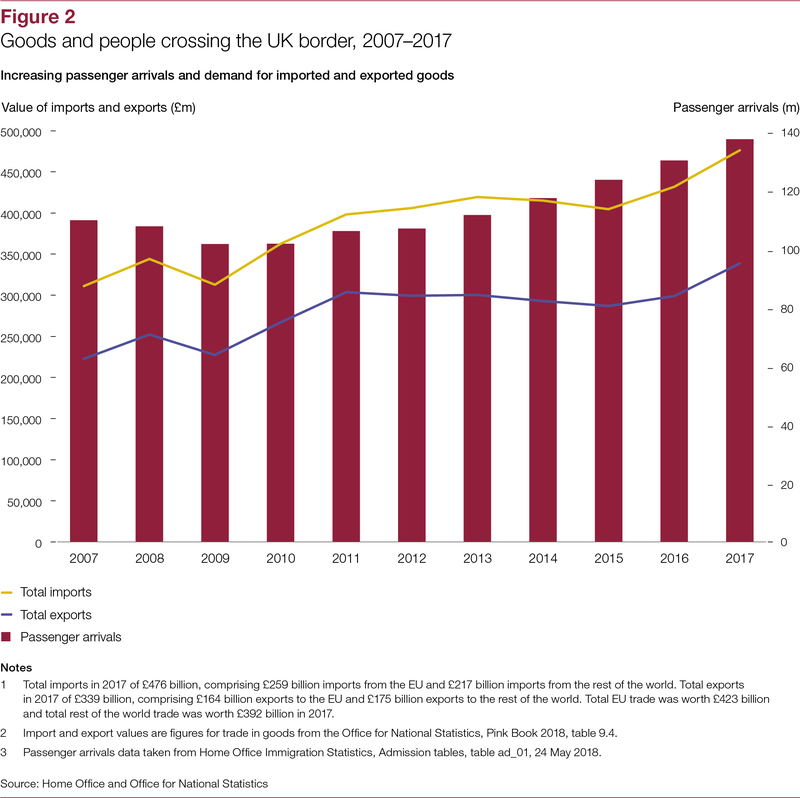 In October 2017, our report The UK border noted that border management is fundamentally important to national security, effective trade, tourism, well-managed migration, healthy communities and the environment. 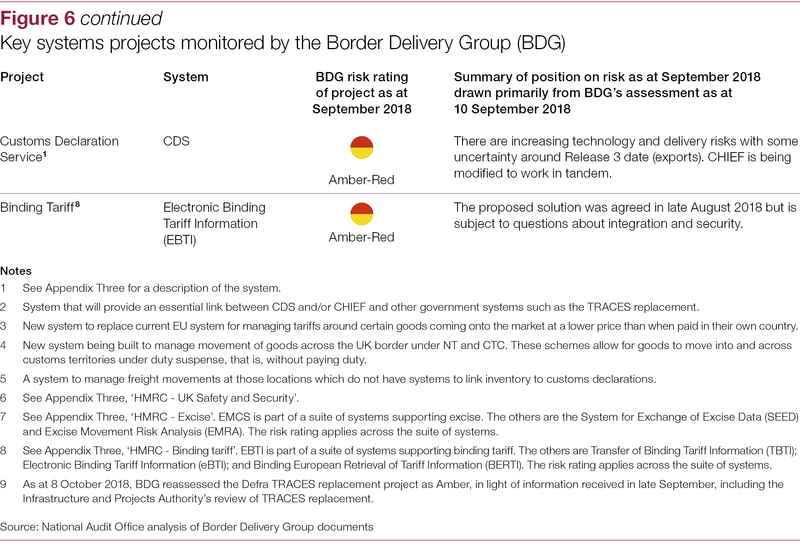 We found that government departments already face significant operational challenges at the border including expected increases in border crossings over time, the nature of security threats changing, funding constraints and a heavy reliance on old technology. 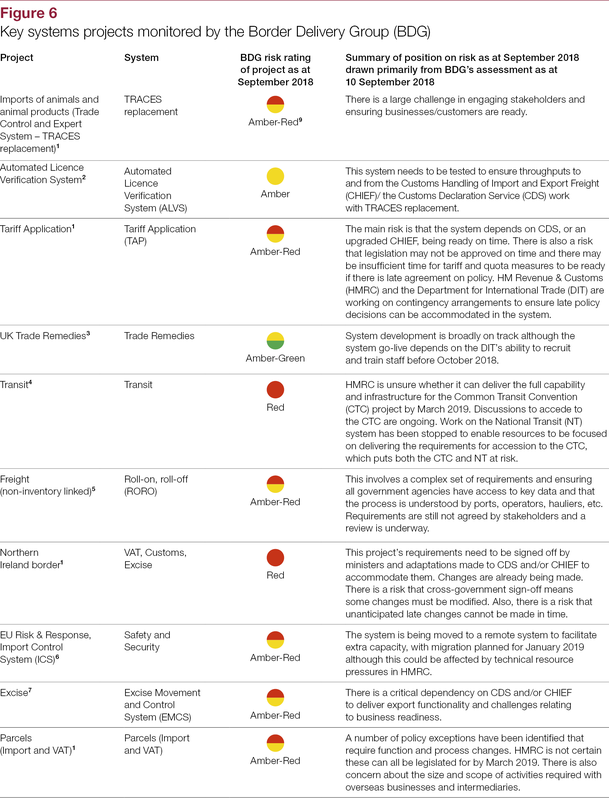 We concluded that the UK exiting the EU could significantly increase these challenges. 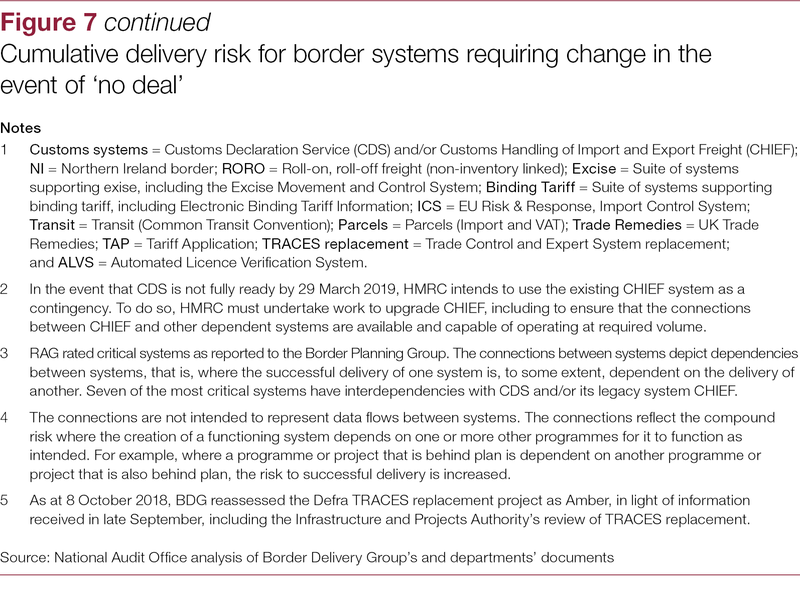 The purpose of this report is to assess how prepared government departments are for the changes required at the border after EU exit. 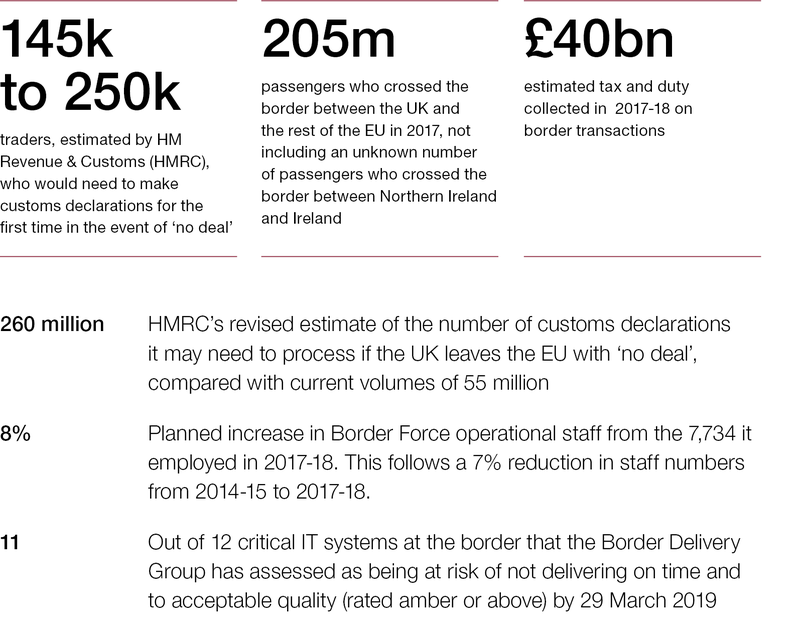 Our focus is on the progress government has made with its operational planning and delivery of the changes to border operations which will be required by the UK’s exit from the EU. 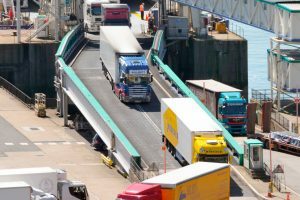 We have examined 20 high-impact border-related EU exit work streams and have visited key ports, Eurotunnel and airports to understand the operational impact of changes in the relationship between the UK and the EU. Our methodology and further detail on work streams are set out at Appendices One, Two and Three. We have not assessed the value for money of departments’ overall preparations or individual border-related programmes. We recognise that the government’s work in the areas covered by this report is developing quickly and our analysis is based on information available up to 19 October 2018. 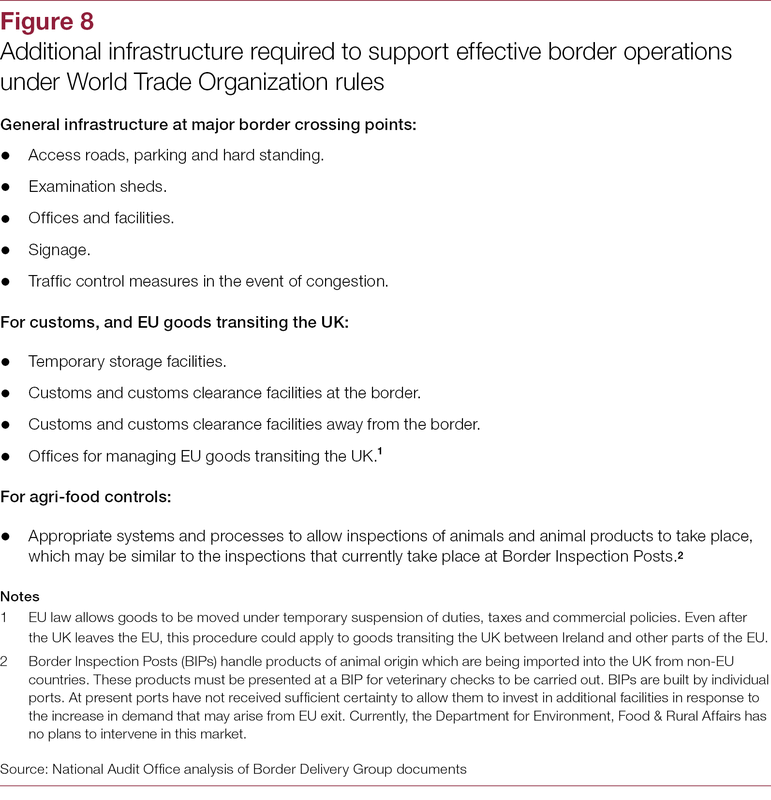 Effective management of the border is critical for the UK after it leaves the EU. It is fundamentally important to our national security, economy and international reputation. 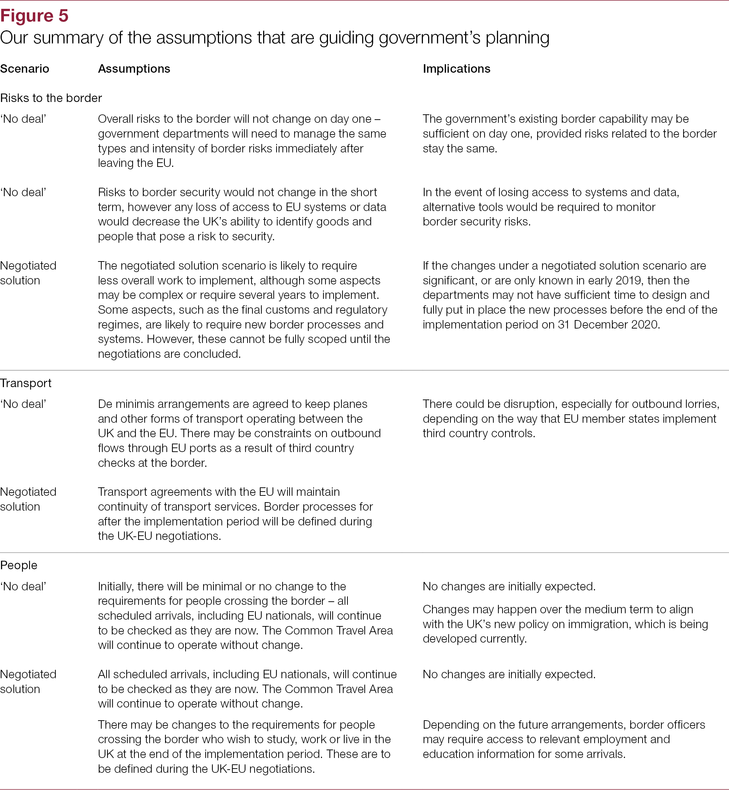 Leaving the EU will trigger some important changes to how the border is managed, but making such changes is not easy. It requires significant effort and the coordination of large numbers of organisations, many parts of government and millions of border users. 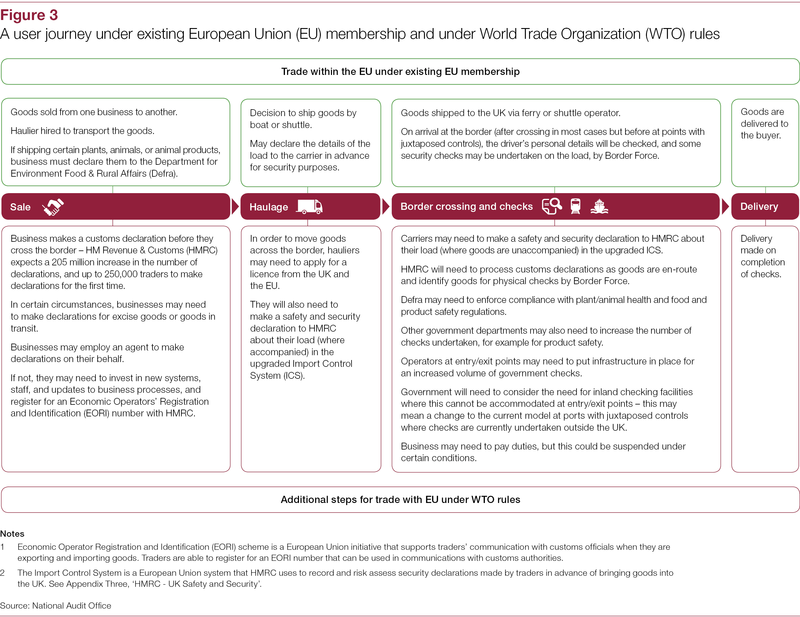 If the government reaches a withdrawal agreement with the EU, industry and government will have until December 2020 to design and implement any new arrangements. 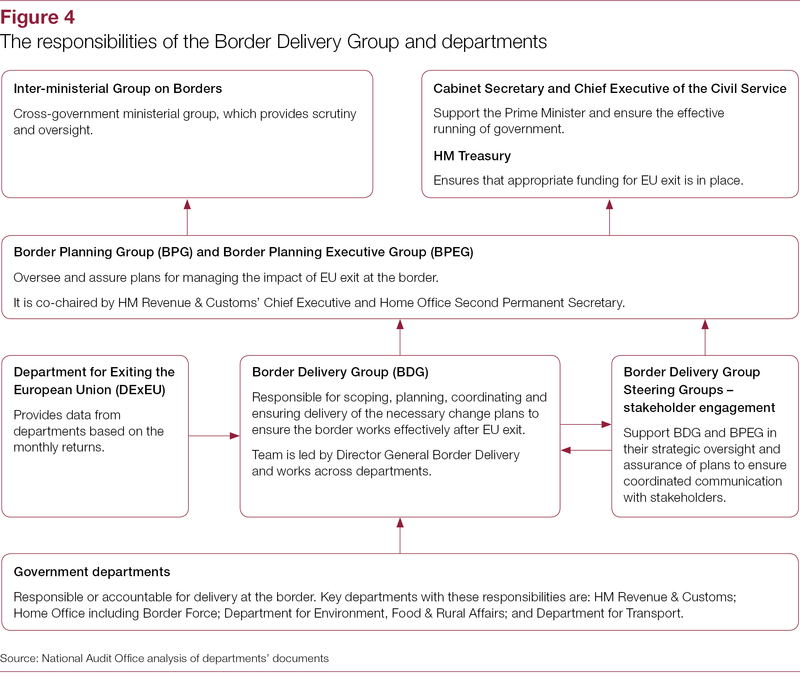 This could involve significant work, such as the implementation of new customs arrangements, and the time available to meet these challenges is not long compared to many complex government programmes. However, the scale of this change will be nowhere near that required if the UK and the EU cannot reach an agreement. 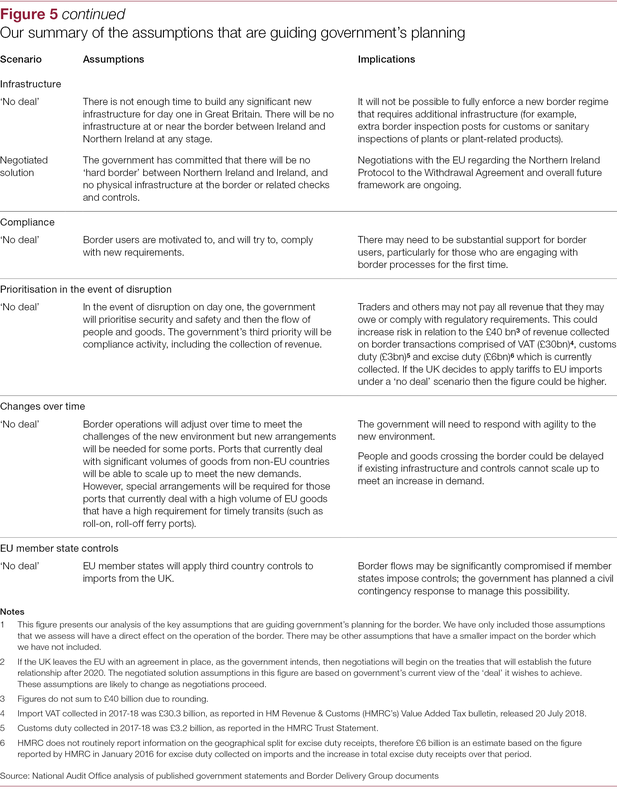 If there is no withdrawal agreement, the government has recognised that the border will be ‘less than optimal’. We agree with this assessment, and it may take some time for a fully functioning border to be put in place. 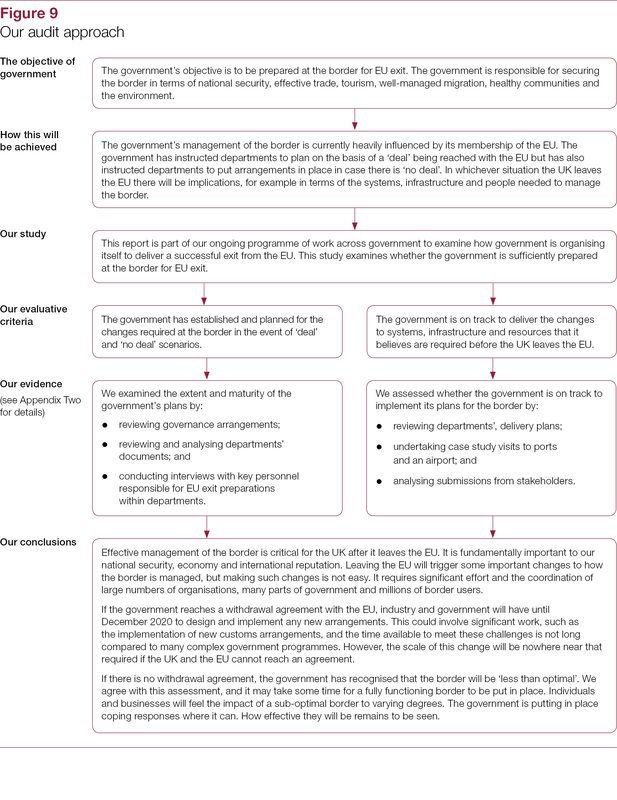 Individuals and businesses will feel the impact of a sub-optimal border to varying degrees. The government is putting in place coping responses where it can. How effective they will be remains to be seen.